This Valentine's Day, many romantic movies had released within 2 weeks itself which made me skip Loveshhuda even though I wanted to watch because of the confidence shown by its newcomer actress in an interview with the reviewer, Komal Nahta. And now that I am done watching the movie, I can say that it's only for people who still like watching romantic movies even if it has same story line and plot of those dozens of movie you saw in 1980s, 90s and 2000s. You can call me one of these viewers because of which I liked the first half of Loveshhuda but the 2nd half is so predictable and cliche that even I had to start checking my watch to know how much time is still to go for the torture to end. Director, Vaibhav Misra, have tried to present the same old product in a new but unattractive package but fails to present anything new. He wanted to show something different so this time he starts a movie where a love story begins after the two people have slept together. Cool! And this happens because of consuming unlimited alcohol as the song plays in background, "Aaj phir peene ki tamanna hai". The boy is grown up by his older sister as his parents died in the childhood itself. She is dominating and decides everything for him. This makes him more wild whenever he is out with friends which makes him over-alcoholic. Okay! After sleeping with this girl, he ends up marrying a girl his sister selects who is just like her- DOMINATING. The couple goes through divorce because of incompatibility and this boy again meets the girl he slept with after 4 years. And what happens after this is the cliche I am talking about. The script of this movie is so poor that we know why new actors are cast in it because anyone with experience of 5 movies will never sign such stuff. What makes Girish Kumar act again is a mysterious case that I think many people will have to study after another few years of cinema. He tries to be Emraan Hashmi sometimes while Saif Ali Khan in rest of the scenes when he is not being Hashmi. There is no originality or USP that he brings with himself. The actress, Navneet Kaur Dhillon, is fine but not superlative. She still has lots of room for improvement but still she was a pleasure to watch on screen. Rest, Tisca Chopra and Sachin does good in their small roles. 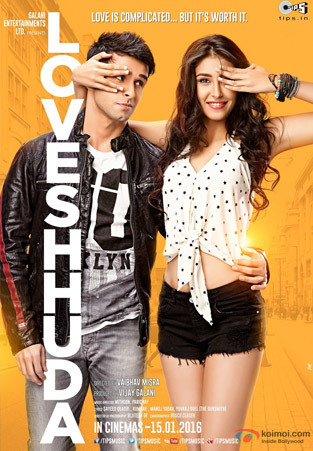 Overall, Loveshhuda is only for die-hard romantic movies lover as I said earlier otherwise it's a complete waste of time. I give it 1 star out of 5.